I mostly buy fabric at thrift stores. I find brand new fabric. I have gotten some really good deals. Check out my finds here, here, here and here! This quilt is made completely from fabric I got at value Village. Total cost of fabric is approx. $13. Last week my sister and I made a trip to two different Value Village stores. I was looking for fabric and wool for my granny squares. Neither was to be found this time, however, I did find these two fabulous table cloths. The beige one will be used as a topper over my current dining room table - it isn't large enough to be used alone. It was $4.99. I'm not sure what I will do with the second one. I don't have a table it will fit - it is a small square. But for $3.99 I couldn't pass it up. can't they make decent small appliances these days? When my son was younger I was able to get him clothing in good condition - but now that he is older, not so much. My sister buys most of her wardrobe at thrift stores. She often finds item with tags still attached for only a few dollars. She is able to update her wardrobe each fall and spring due to the savings. Even if we don't find a good deal at a thrift store, we always have fun checking out all the stuff and saying "wow didn't Mom have one of those?" or "I remember that!" It's also a great place to buy books. So if you haven't recently, go check out your local thrift store - they work for me! 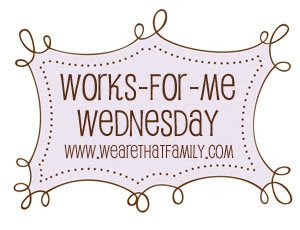 For more great Works For Me Wednesday tips, stop by We are THAT family. OH YA, you know how I love trifting hence my blog name. Those two table cloths are beautiful the white on white one is amazing. You must have some kind of small table in the house you can put it on. So pretty! My iron spits out water too. So, I never iron anymore! Good enough excuse for me!